Fireplace, non-smoking property, dishwasher, microwave, washing machine, hair dryer, telephone, internet point across the street , television (flat screen - French stations only ), music center, CD player, walk to shops (restaurant ), walk to beach (river swimming ), walk to river (grocery/cafes). - For more listings request the catalog. Discount on rentals of 2+ weeks. View of the village and the house at the bottom right of the photo. Terrace with its view of the village. Dining room and living room with door to terrace. Dining room with door to the terrace. The dining table with fireplace behind. Living room with exposed stone and stairs to the upper, bedroom level. Living room with door to the side terrace and the street. Eat-in kitchen with door to the patio on the lower level. Ground floor patio with open country beyond. The river with the castle above. We are fortunate to offer this charming small village house in Montfort whose castle dates from the 15th century. Located on the lowest street of the village, the house faces open countryside with the rest of the village rising behind it to the castle. The house is tastefully renovated with antiques. The kitchen is on the lowest floor with a covered patio. The eat-in kitchen is new and well-equipped. There is a toilet and utility room with washing machine on this floor. The mid-level has a pretty living room/dining room and a terrace that takes advantage of the lovely castle views. This gracious room has antiques and art, a beautiful decorative fireplace, exposed beams, comfortable seating and doors to the terrace. The uppermost level has the bedrooms and is fully carpeted. As Perigord houses have steep sloped roofs that comprise almost a third of the building, this floor has attic-style ceilings with beams and one slanted wall. One bedroom has two single beds together to make a king. The other room has a double bed. Although small, these rooms are well designed and very pretty with antique beds and excellent lighting. There is a shower room with bidet and sink and separate toilet. This is a lovely accommodation in an authentic Perigord house located in a very special village. "Beautiful accommodation! Very comfortable and cozy. Top notch equipment-stove, dishwasher, washer, iron. 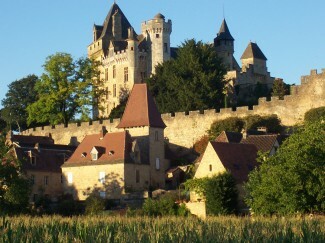 Convenient location to many wonderful villages and chateaux. Great modern upstairs bathroom. Loved the shower! Appreciated the hair dryer and top notch towels." "We loved the property. It was peaceful, wonderfully located for walking or fishing along the Dordogne River. We had nice French neighbors at the house next door and we had an aperitif with them. The kitchen and bathroom were clean and modern. Lots of books to help with touring."